Galatasaray are prepared to offer forgotten Liverpool striker Divock Origi a way out of Anfield in the upcoming transfer window. Turkish-Football report that the Super Lig giants are willing to give the Belgium international a chance at first team football this season, if he joins their side in January. Since returning to Merseyside, after a one-year loan spell with Bundesliga outfit Wolfsburg, Origi has struggled to work his way into Jurgen Klopp's plans. So far the former Lille striker has found himself way down the pecking order - having yet to feature in the Premier League in 2018/19 - and has had to settle for minutes in the reserves with the Under-23 team. Origi scored and assisted in his single Premier League 2 fixture, suggesting he's too good (and expensive) to be playing regularly at that level. With Roberto Firmino and Daniel Sturridge, Jurgen Klopp's preferred options in attack, a January move is looking like the only real option for Origi who was unable to find a new home in the summer despite links with a number of Premier League and foreign clubs. Over in Turkey, Galatasaray have struggled to replace last season's star man Bafetimbi Gomis after losing him in the summer to Saudi club Al-Hilal FC. Gomis scored an incredible 29 league goals last season, firing his now former team to Süper Lig glory. With first-choice striker Eren Derdiyok out injured, the Turkish champions are desperate for a new forward. On top of this, Origi's acquisition is all the more alluring as - having missed out on Liverpool's Champions League squad - the Belgian is still be eligible for European competitions. Galatasaray are said to be keen on getting this deal as soon as possible. 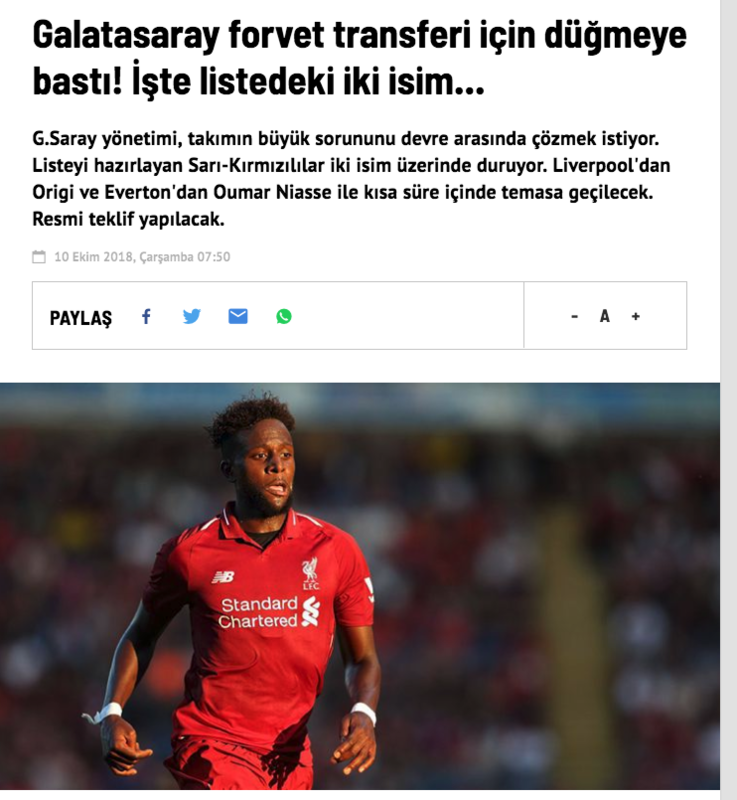 The daily Turkish sports paper, Fanatik, claim that the club from Istanbul hope to open talks with Liverpool in the next few days.